The third Easy Java Simulations workpanel is the View. This workpanel allows us to create a graphical interface that includes visualization, user interaction, and program control with minimum programming. The way that the View Elements are visualized reflects the way the view elements of the simulations are organized: a tree structure. 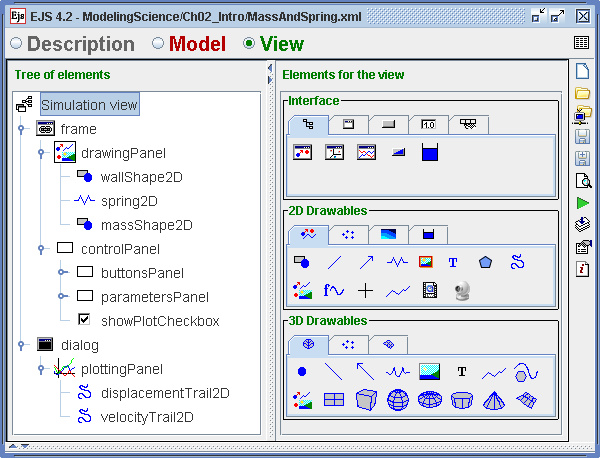 In this particular example, the mass and spring simulation, there are two windows, a Frame and a Dialog. These elements belong to the class of container elements whose primary purpose is to visually group (organize) other elements within the user interface. The tree displays descriptive names and icons for these elements. View elements are added to the view using drag and drop. Clicking on a view element selects it, and the cursor changes into a "magic wand". The view element is then dragged to the tree of elements, and dropped onto an appropriate parent element. To a large extent the ordering in the tree view determines how child elements will be positioned inside their parent element. This is complemented with layout properties. Layout properties guide how child elements are positioned inside their parent elements.